This pleasantly sited, attractive two-storey complex is comprised of 2 studios and 14 apartments all simply but nicely furnished. They are quietly positioned on a little hill, within pretty gardens and are surrounded by an olive grove. The facilities include the use of a swimming pool with children’s pool, sun beds and umbrellas, large gardens and plenty of parking space. Air conditioning is available at an extra charge. A: Two studios for 2 people, with one bed/living room with double bed, kitchenette, shower/WC, and balcony. B: Fourteen apartments for 3-4 people, with one twin or double bedroom, living area with one or two sofa beds, kitchenette, bathroom with hip-bath or shower/WC, and balcony or terrace. The nearest mini market is about 50 metres away. The sea, and bus stop with a regular bus service to Chania can be found 300 metres away. The sandy beach of Kalamaki and shops/tavernas are some 450 metres away while the picturesque town of Chania is situated at a distance of 5 km. 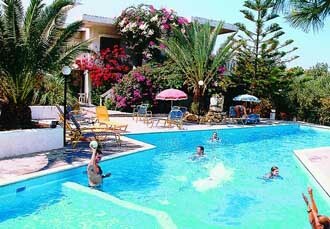 This is a lovely spot, perfect for a peaceful and relaxing holiday, and one, which is particularly safe for children.